I’ve never been a person who enjoyed breakfast. Brunch? Yes. Breakfast for dinner? Definitely! But eating first thing in the morning only a short time after waking up? No, thank you. Unfortunately, breakfast is one of the most important meals of the day. Even more important now that I am pregnant and my days have become exponentially busier now that my daughter is in school. Our day starts sharply at 7:15am and it’s nonstop movement until at least 9am. Skipping breakfast until I’m hungry is no longer an option so I’ve been looking into light but filling options to keep me going through the morning. Traditionally I love the heavier breakfast items like bacon, sausage, eggs and hash browns. Unfortunately they’re simply too heavy in the morning. Instead I’ve been searching for recipes unlike any other breakfast I usually eat. I started with fruit and yoghurt because it’s alway been a favorite snack of mine. Thanks to Noosa yoghurt, I’ve been #noosafresh challenged to create a few new recipes unlike any other to combine with my daily yoghurt. Using a circle cookie cutter, remove the center of your toast. Melt a tab of butter in your favorite frying pan and add the toast. Crack the egg into the center of your toast. Allow to fry for about 1-2minutes until the egg is cooked on one side. Salt and Pepper before flipping over. Cook an additional 1-2minutes until the egg is fried. Even though I grew up in the North, thanks to my snowbird grandparents, I have a few distinctly southern tastebuds. For instance, eggs, whether they are fried, scrambled or sunny side up are meant to be eaten on toast. Taking that Idea I jumped on the bandwagon with the new egg in toast concept, it’s an egg unlike any other! I was surprised at how easy these are to make too. I paired this tasty meal with a bowl of noosa® pumpkin yoghurt. Now I know what you’re thinking. Pumpkin?! I thought the same at first but noosa yoghurt is unlike any other I’ve had before. This creamy yoghurt has this delicious smooth texture with just the right amount of flavor. There is just the right amount of pumpkin flavor without feeling like you’re being hit over the head with it. Plus, noosa® contains 6 grams of protein and 20% of my daily calcium in just 6oz. 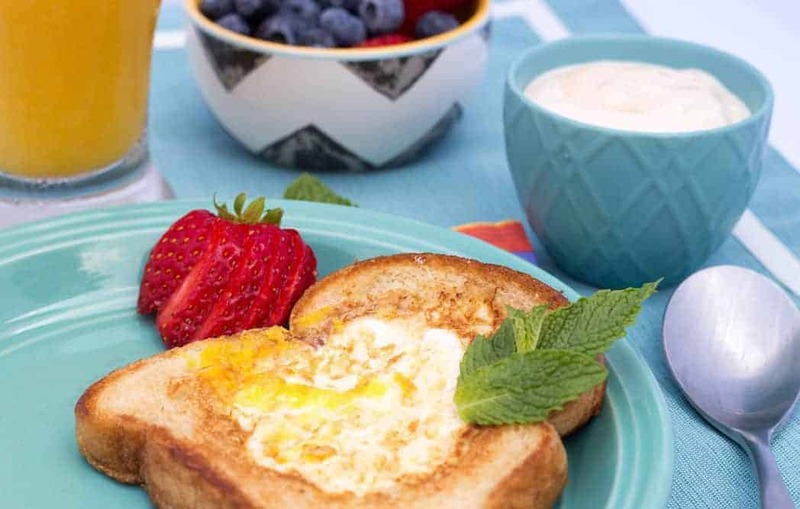 Plus, the whole grain toast and egg are packed with more proteins and grains. Which keeps me feeling full and happy knowing I’m providing baby with a great source of nutrition. Allow to cool slightly and spread the cream cheese. Top with fresh berries and sprig of mint. Pair with noosa® cranberry apple yoghurt. If you like your breakfast fruity you’re going to love this duo. 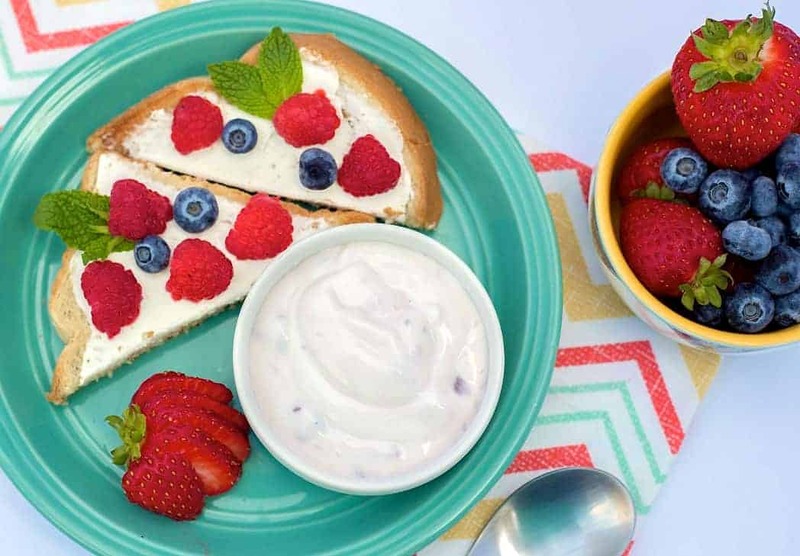 The lightweight cream cheese and berries takes toast for plain and boring to flavorful. 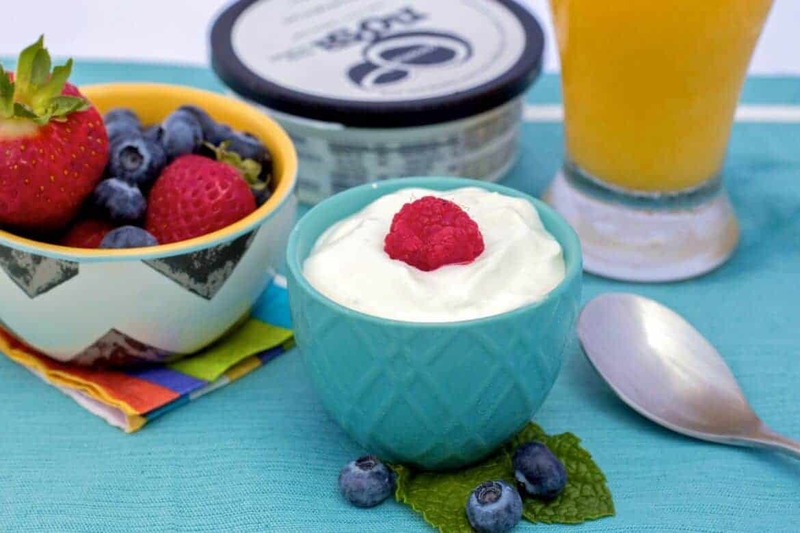 The richness of the toast pairs perfectly with sweet and tart noosa® yoghurt. One of the things I loved about the cranberry apple flavor is that it’s thick and rich which helps me feel satiated. 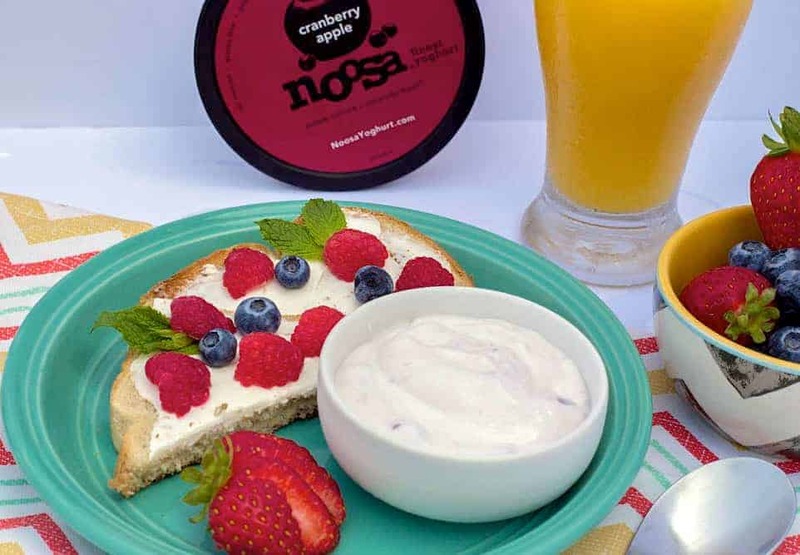 Yoghurt is great with my breakfast but it’s bright fruit flavors make noosa® a delicious snack all on it’s own too. It’s made with farm fresh ingredients including fresh whole milk, clover alfalfa honey and juicy, ripe fruits. This is a sponsored conversation on behalf of noosa. All opinions remain my own. These look so good! I love toast and I like that I have a choice between sweet and savory combos. I will be making these both for breakfast on the go. I want to try that berry mint toast. That sounds soo good! The cranberry apple spread sounds so delicious. What a great way to jazz up your toast for breakfast.